If you’ve seen the action packed blockbuster Tomb Raider you’re sure to remember Lara Croft charging through ancient temples in search of forgotten treasures. What most people don’t realise is that Tomb Raider was filmed in one of AdventureHoney’s favourite locations, the Angkor temples of Siem Reap, Cambodia. The Angkor temples date back as far as the 9th Century and provide a unique insight into a fascinating civilisation. Cambodians LOVE Angkor. From their national flag to their national beer, Angkor sparks a sense of national pride like nothing else for the locals. The Angkor temples are also the perfect spot for adventure travellers to live out their own tomb raider experience! AdvenutreHoney has got you sorted with the three best Angkor temple tours. Are you the type of adventure traveller who loves getting off the beaten track? Then the Kulen and Beng Melea walking tour is the perfect AdventureHoney experience for you! 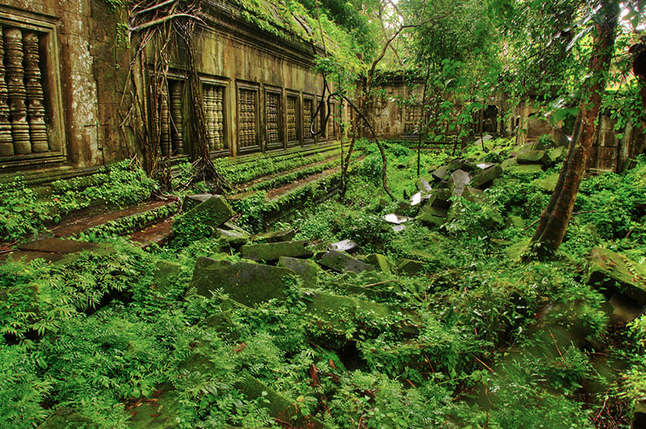 Hidden deep within the Cambodian jungle these temples are some of the best-kept secrets in Cambodia! The area was only cleared of landmines in 2003 meaning it is a relatively unheard of highlight of the Angkor experience. You’ll start your day with a trek around the foot of Phnom Kulen Mountain visiting the site where King Jayawarman II first declared a unified and independent Khmer empire. Spend the rest of the morning exploring the waterfalls, river and ancient pagodas then fuel up on lunch before the tour highlight, Beng Mealea. Draped in jungle vegetation, this massive one square kilometre temple is truly like something you only see in the movies. Spend the afternoon exploring this ancient monument and you’re sure to get a taste of what 9th Century Khmer life was really like. If this sounds like your kind of adventure experience check out it out on AdventureHoney, our favourite Angkor tour for off-the beaten path adventurers. If you’re keen to get out of the hustle and bustle of Siem Reap the Koh Ker day trek is the perfect Angkor day tour. Just 120km outside of Siem Reap was the capital of the old Khmer Empire and with some of the most beautiful scenery in Cambodia you’ll wonder why they ever left! Take your time exploring the main ruin of the complex, Prasat Thom, as well as some of the smaller well-preserved ruins in the area. About two dozen monuments and temples can be visited and your English-speaking guide is sure to show you nothing but the best! This unique Cambodian adventure experience is sure to be a highlight of your trip. The Angkor temples and the city within which they reside is vast. This was one of the biggest cities on Earth in its prime with an estimated 1 million inhabitants. The challenge is: how do you cover as much ground without being rushed or losing the authenticity of the experience. This tour provides an excellent solution. 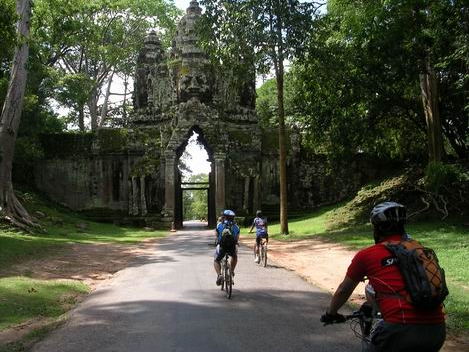 The one day Angkor Cycling Tour is the perfect way to combine adventure and sightseeing in a really relaxing, immersive way. Depending on how highly you fancy your cycling skills the ride spans from 28km to 38km and covers the popular small circuit. You will experience the majesty of Angkor Wat as well as the detail of smaller temples such as the Terrace of Elephants and Angkor Thom. Finish the day with a stunning sunset Phnom Bakheng before transferring back to your hotel. A truly wonderful way to experience the temples of Angkor. Which of the three would you like to do? All of the above! They all sound (and look) incredible.